I set up Xubuntu 11.10 on the Dell 531S driving the Thing-O-Matic, as the Unity UI seems surprisingly like crippleware: every feature that isn’t mandatory is prohibited. 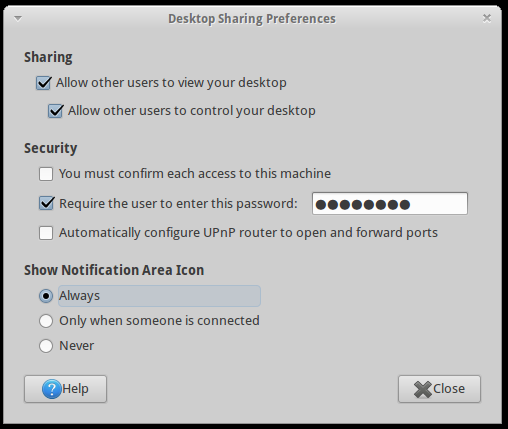 However, Xubuntu’s XFCE UI also has a long list of things that should be easy and aren’t, such as enabling remote desktop sharing. Gotta have that so I can fire up the printer and monitor progress from upstairs. This is a local machine behind a firewall, so a moderately secure password with no confirmation will suffice. Your paranoia may vary. Then drill down through the menu from Settings → Settings Manager → Session and Startup to the Application Autostart tab, then Add the Vino VNC Server to the list: /usr/lib/vino/vino-server. You can start it manually if you have the hots for immediate sharing. This seems to be impossible in Unity, trivially easy in GNOME, and unduly mysterious in XFCE. This entry was posted on 2011-12-18, 07:57 and is filed under Machine Shop, PC Tweakage, Software. You can follow any responses to this entry through RSS 2.0. Both comments and pings are currently closed. Thank you, that was exactly what I was looking for. That feature certainly shouldn’t be so well hidden!